While mobile media sharing has become a big thing with the rise of apps like Instagram, Amsterdam’s Mobypicture has been quietly building a solid following for its own service which is a real sharing powerhouse supporting photos, video and audio across 20 social services. Now, the startup has released a new version of its iPhone app that takes things up a notch, turning Mobypicture into a destination of its own as well as a cross-posting tool. The new app builds new social features into the app, allowing you to follow media posted by friends in one place, no matter where else they’ve posted it. You can also explore what has been posted by all users of the service using a new Explore feature. This displays popular postings in the ‘Trending’ section, a map to view recent geotagged postings from any location. A free text search lets you search for any kind of topic, person or tag. Supported services cover a broad base, from the likes of Twitter and Facebook to Flickr, YouTube, WordPress and more. It would be nice to see a few more additions, such as SoundCloud support for audio, added. Mobypicture is free to use and is supported by working with brands who can pay to set up a ‘Mobynow’ service that aggregates related social media activity. It also offers an API that allows third-parties to easily implement social sharing features. 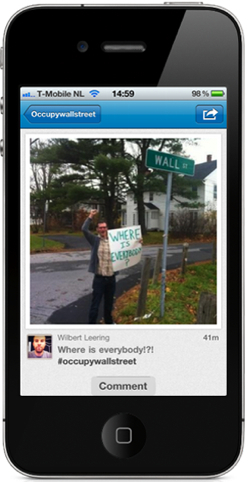 The new app is certainly a slick product, although there are a couple of rough edges around the user experience. When you load it up as a new user, you’ll see empty ‘Stream’ and ‘Activity’ tabs as you have no Mobypicture friends yet. It would be nice is the friend finder tool was situated there to fill the space – instead, it’s in the app’s settings. Also, adding services isn’t quite as easy as it should be, sending you off to a mobile version of the Mobypicture website which only lists a supported services – it’s a lot easier to manage your account from the full site. The startup tells us this will be made a lot easier with coming versions of the app. 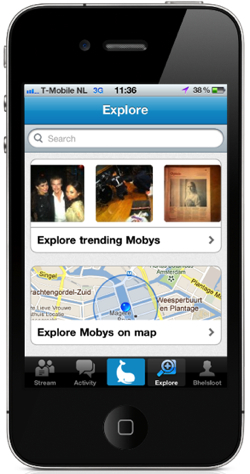 Mobypicture’s updated app is a free download and available now.